It was bound to happen. Nobody is surprised that the John McArthur-wing of Reformed Protestants published a recent series of denunciations of “social justice” that they believe is infecting evangelical churches in America. I put social justice in scare quotes because MacArthur’s particular definition of it would probably not comport with how many evangelicals who care deeply about justice issues would use the term. Let me state up front I think MacArthur makes some very salient points and that much of what he critiques is real and present in certain segments of evangelicalism. It’s probably more prevalent among young evangelicals and urban evangelical churches where issues of race and gender, the two lightning rod issues of the moment, are more pressing than in suburban and rural areas. The rise of victimization culture is real. MacArthur points to victim culture as the central feature of the current social justice movement. Identity politics, intersectionality, critical race theory, Marxism, and a whole host of other intellectual currents on the left have been working their way into the general public for some time and are now finding their way into evangelical churches. The primary criticism that MacArthur levels is that to see oneself primarily as a victim is to fail to see oneself as a sinner before God in need of repentance and forgiveness. Nowhere is this more prevalent than probably on college campuses, in liberal and progressive media, and among intellectual and activist circles. Every week there is a new story about students on a college campus or a professor doing some ridiculous or outrageous act to some conservative or someone else not sufficiently “woke.” Defending the woman who accused Supreme Court nominee Brett Kavanaugh of sexual assault, Mazie Hirono, senator from Hawaii, recently lashed out at all men during a press conference, yelling “just shut up and step up.” We could go on and on. One can see it breaking into evangelical circles, as MacArthur himself notes. One needs to look no further than Fuller Seminary president Mark Labberton’s speech to a group of evangelical leaders in Chicago. I was critical of Labberton’s speech for many of the same reasons that MacArthur is critical of some evangelicals’ unthinking appropriation of social justice ideas and activism: it’s faddish, light on theology, heavy on sentiment, and heavy on progressive politics. That’s not a terribly good mix by my reckoning. The rather uncritical adoption of certain lines of argument about “privilege” is vague and conceptually suspect. Often, we see how evangelicals who have adopted some of the burgeoning social justice crowd’s ideas and rhetoric have allowed their political preferences to overwhelm theological conviction. While I do not think that those who deploy privilege-language are Marxists, per se, or that they could spell out the fundamental features of doctrinal Marxism, the ideas that are central to Marxism have a built-in us-versus-them mentality that breeds conflict. Marxism tends toward a rigid framework that creates a clear demarcation of good versus evil. Further, it sets in stone an aspect of one’s identity—gender, race, class, etc.—that should be relative to one’s identity in Christ. That does not mean those relevant aspects of a person’s identity are not important or should not be considered, but we ought not make them basic. But, and this is a fairly significant “but,” I think MacArthur overgeneralizes too much and lapses into caricature too often. Many good and biblically orthodox Christians care about justice and do not lapse into the sort of identity politics or victimization-fetish that MacArthur rightly critiques. From my experience, many of the Christians who are working to bring justice to their various communities have come to care more deeply about justice issues because of the Bible and not neo-Marxism. Instead of hitting a particular group within the justice movement, MacArthur’s rhetoric can sometimes veer into broader criticisms that are not accurate. I have spent time abroad in India and Russia with Christians who care for orphans because of God’s desire for justice and mercy for these vulnerable children. The problem with MacArthur’s denunciations is that he does not lay forth a positive vision of justice. And so he is right in his denunciations but lacks a constructive position on justice. As Thabiti Anyabwile points out, MacArthur’s fundamentalist tendencies come out in his unwillingness or refusal to spell out more clearly what he believes biblical justice entails. While many evangelicals might be sympathetic to some aspects of the current social justice movement, I do not think the pervasiveness of the problem is as broad and deep as MacArthur imagines. Yes, there is a very vocal group of evangelicals—the Shane Claibornes and Jim Wallises of the world—but they are a minority whose numbers are not growing. The popularity of Reformed orthodox figures such as Tim Keller, John Piper, and Russell Moore should be a sign that left-wing evangelicalism is not on the ascendency. Also, the imminent collapse of Mainline Protestantism should caution against overreacting to the current social justice movement. Further, part of the concern for issues of justice is an appropriate response to evangelical indifference or ignorance to the experiences of other non-white groups in America. That is a good thing. It’s easy for majorities to overlook the concerns or perspectives of minorities. I think we can all agree that it took far too long for blacks to receive full civil rights in this country. Martin Luther King Jr. and the civil rights movement pointed to the importance of justice for Christians. MacArthur must do more to address the very clear importance that the Bible lays upon justice. Even if we grant that MacArthur has a point, and I believe he does, the social justice crowd may also be pointing out an issue of concern, even if it uses flawed language and concepts. It’s a tragedy that calls for justice are often used as weapons in our increasingly fraught political culture. Just because somebody claims something as an injustice does not make it so. Lastly, I would point to the history of the Reformed tradition that MacArthur claims as his own. Reformed Protestants have a very long and rich tradition of reflection on justice and politics. John Witte’s The Reformation of Rights meticulously documents the impressive ways that John Calvin’s heirs used Reformed theology to shape political thought and structures in Europe and America. The Puritans played an extremely important role in the shape of America’s own constitutional republic. Many Reformed Christians have lost contact with their own theological heritage. MacArthur’s critique, while important, needs to move beyond denunciations to a positive vision of Christian justice. There is no better place for him to start than with his own Reformed heritage. 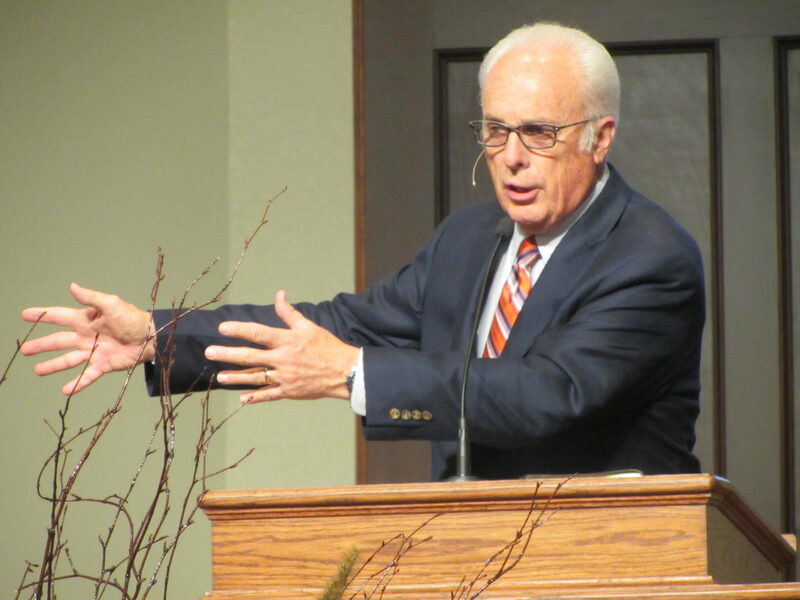 Photo Credit: John MacArthur preaching in 2013, via Wikimedia Commons.